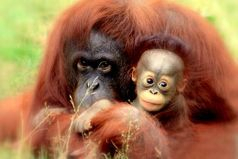 Why Are Orangutans in Danger from Palm Oil? Orangutans are great apes and are one of humans’ closest relatives (“orangutan” means “man of the forest” in the Malay language). 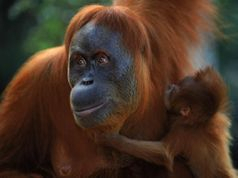 There are two species of orangutan, the Bornean orangutan (Pongo pygmaeus) and Sumatran orangutan (Pongo abelii). They are the only great apes that exist outside of Africa. Orangutans live about 45 - 55 years in the wild. Females reach puberty at around 10 but do not give birth until they are approximately 15 years old. Pregnancy lasts 8½ months, after which the infant suckles until age three. Even when weaned, the infant is carried by its mother until it is four years old and stays with her until it is between 6 and nine depending on each individual but generally about seven years old. Females bear an infant only once every seven to nine years, so a female can produce, at most, four offspring over her lifetime unless on the rare occasion she has twins. Orangutans live in rainforest trees. They search for food during the day and construct nest-platforms of leaves and branches for sleeping. Their diet is largely rainforest fruits, but they also eat leaves, shoots, bark, and other material. Adults are usually solitary, except when females have young. Orangutans live in overlapping home ranges of variable size. One square mile of prime habitat in Sumatra can support nine individuals; marginal habitat can support only two individuals. For each genetically healthy viable subpopulation, at least 500 individuals are needed because average home-range sizes differ, that means about 385 square miles per subpopulation in Borneo and about 230 square miles in Sumatra. Both species of orangutan are in crisis. When shrinking habitats push orangutans nearer to human settlements they raid fruit orchards and oil palm plantations, and get trapped or shot. One orangutan can eat as many as 50 young oil palm shoots in one raid so you can see why they are consider a pest by palm plantation owners and villagers when they raid their crops. 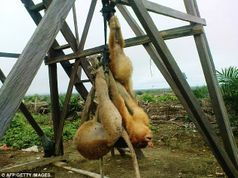 Sometimes plantation managers offer a bounty for each dead orangutan. 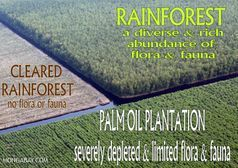 Areas of oil palm disrupt animal social systems by hindering migration patterns and blocking travel corridors. A single plantation may cover an enormous area—in Indonesia, an average company manages a plantation area of about 40 to 100 square miles.97 Large rainforest animals, such as elephants, tigers, and orangutans, need to be able to move over large distances under forest cover to find water and food; young adults need to leave the family and establish their own territories in order to mate successfully. 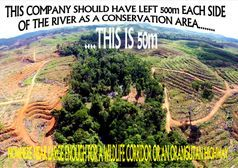 Plantations block animals because companies do not keep corridors of forest available for animal movement. Further, animals may be killed if they “trespass” onto the plantation or search for food outside the forest. Tigers and plantation workers frequently come into conflict.